But it's not only that Lance used PED's, it's the extent he went to cover it up. The US Anti-Drug Agency made this statement in October 2012 accompanying 1,000 pages of evidence against Lance Armstrong. It's not like Lance just denied his drug use once or twice. This article gives a short list of Armstrong's denials over a 10 year period. Look at this quote from June 2012 where he throws all his teammates and associates under the bus while claiming his innocence! Not only did he make denials of PED use in interviews, he sued those who accused him of doping. In 2006 he settled with the British newspaper, the Sunday Times. The paper is now suing him for $1.5 million. That should be interesting. Earlier a book published in 2004 (L.A. Confidential: The Secrets of Lance Armstrong) received the same treatment. Armstrong sued everyone associated with it, including media outlets that published excerpts. Other interviews I've heard on the radio describe Armstrong as a bully, who would run other riders out of the sport if they said anything about his doping. Lies, on lies, on deceit, on bullying, on lies, on conspiracy, on scheming, on lies, on protestations of innocence, on lies, and maybe on bribes. AND NOW HE ADMITS HIS GUILT! 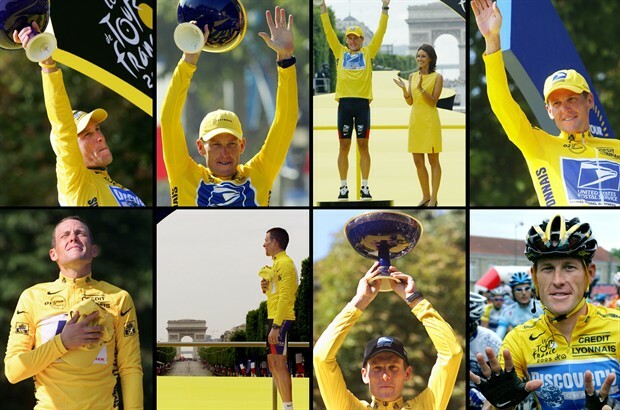 Armstrong has now lost his sponsors, his role at his own charity Livestrong, and his 7 Tour de France titles. Complicating the whole issue is the good work that his Livestrong organization has accomplished in the field of cancer research. One report I read said that it has raised over $500 million since it was founded about 15 years ago. That's a lot of helping. While no one wants to see that research suffer, we can only blame Lance Armstrong for the foundations tarnished image, just as we must recognise that the $500 million would never have been raised without him. Lying often seems like a minor moral flaw, but it is fundamentally opposed to God's nature. In John's gospel, Jesus describes himself as the Truth. While in John 8 he describes the devil as "the father of lies". Armstrong's world may come crumbling down, but that's not surprising when his lifestyle has been built upon a lie. Strangely, in the same week a bizarre story has made headlines about Notre Dame's star player and Heisman trophy finalist, Manti Te'o. During the season his personal background story made headlines. Not only did his grandmother die mid-season, but his girlfriend who'd survived a car accident only to be diagnosed with leukemia, died a few days later. Now it turns out that the girlfriend was never anything more than a figment of the internet's imagination. Whether Te'o was the victim of a cruel hoax, or part of an attempt to gain publicity to support his Heisman run, his life has been turned upside down when the deceit has been exposed. Apparently this fiction came to light in mid-December which raises the question of whether it affected his preparation for the national title game where he played poorly. You can read all the details here. It's crazy. You wouldn't find it at all believable if it was a fiction story... but it's apparently true! "It further pains me that the grief I felt and the sympathies expressed to me at the time of my grandmother's death in September were in any way deepened by what I believed to be another significant loss in my life. "I am enormously grateful for the support of my family, friends and Notre Dame fans throughout this year. To think that I shared with them my happiness about my relationship and details that I thought to be true about her just makes me sick. I hope that people can understand how trying and confusing this whole experience has been.